Munchkin loves Winnie the Pooh. 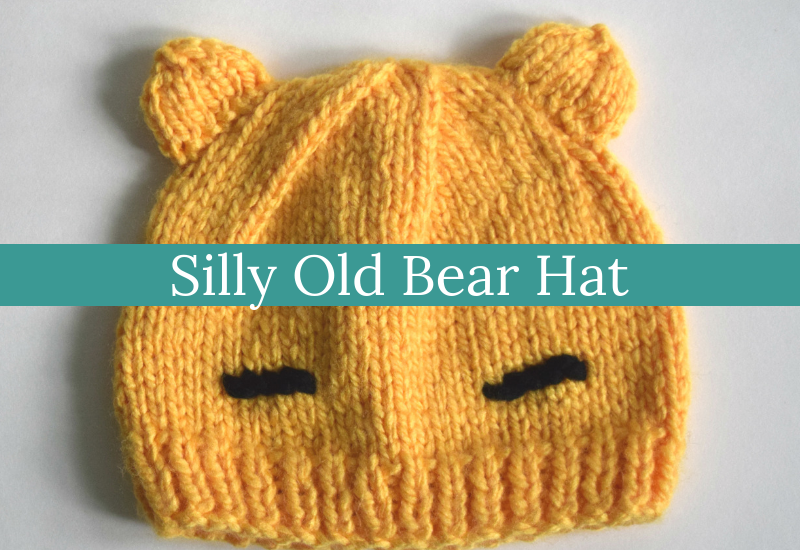 So Munchkin got a Pooh hat, modeled on a combo of the baby bear hat that I made for my new little nephew last year and the Pooh costume that the boys loved when they were 18 months old. The eyebrows came out looking a little funky–they’re sewn on at the end, so if you prefer the hat without them, you can leave them off. Needle: US size 10.5 (6.5 mm), straight needles; US size 10.5 (6.5 mm) double pointed needles. Yarns used: Loops and Threads Charisma (Bulky (5); 100% acrylic; 109 yards/100 grams), 1 skein of Yellow. 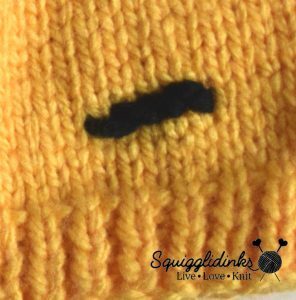 Black scrap yarn (I used about 2-3 yards of Lion Brand Wool Ease Thick and Quick) for eyebrows. Gauge: 13 stitches and 18.5 rows = 4 inches. Other Notions: yarn needle for finishing. Final Measurements: Pattern is written for Infant (16”), Toddler (18.5”), and Child/Teen (20”) sizes. Sizes will be written Infant (Toddler, Child/Teen) in the pattern. Using straight needles, cast on 54 (60, 66) stitches. First 5 rows: k1, p1, repeat to end. Continue in st st until hat measures 3.5 (4, 4) inches from cast on edge. Row 1: k7 (8, 9), k2tog, repeat to end. Row 3: k6 (7, 8), k2tog, repeat to end. Row 5: k5 (6, 7), k2tog, repeat to end. Row 7 (Skip this row for Infant size—Toddler and Child/Teen ONLY): k(5, 6), k2tog, repeat to end. Row 8 (Skip this row for Infant size—Toddler and Child/Teen ONLY): purl. Row 9 (all sizes): k4 (4, 5), k2tog, repeat to end. Row 10: p2tog, p3 (3, 4), repeat to end. Row 11: k2 (2, 3), k2tog, repeat to end. Row 12: p2tog, p1 (1, 2), repeat to end. Infant and Toddler, Row 13: k2tog, repeat to end. Child/Teen, Row 13: k1, k2tog, repeat to end. Child/Teen, Row 14: p2tog, repeat to end. Cut yarn so that you have a 20” tail. Thread through the remaining 6 stitches and pull tight. 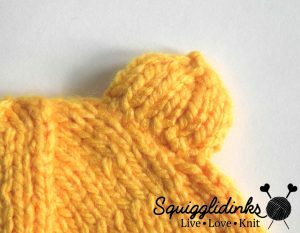 Use the tail to sew up the side seam of the hat. Using the double pointed needles, cast on 12 sts. 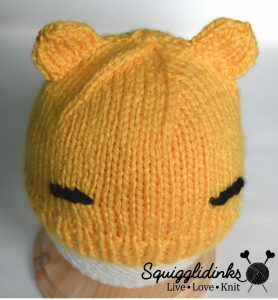 (It’s easiest if you use the long-tail method, because you’ll use the tail to attach the ears to the hat.) Join into a circle, being careful not to twist your stitches. First 4 rounds: knit all sts. Cut a 6” tail and sew through remaining 3 sts; finish by sewing end under. Lay hat flat. 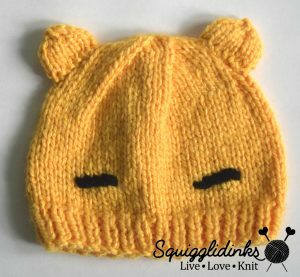 Position ears on either side of hat so that there is about 1.5” (for Infant/Toddler) between the side of the ear and the top center of the hat (space them a little wider for Child/Teen size). With black yarn, backstitch eyebrows. Begin 4 stitches above the ribbed brim and continue across for about 5 stitches. Sew ends under.